Unless you live in a mansion and have tons of space, chances are you won’t be able to keep every toy your child ever owned. Donating some toys during the holiday season can be a good idea, especially if the toy is in excellent condition. Selling used kids toys, however, is another option and can become a profitable endeavor. With a little research and legwork, you can sell old toys and even put some money in your kid's piggy bank. Set aside all the toys you’re considering selling. Put them in a box and away from view for at least a week to see if your child misses them. This will stop you from making the mistake of selling a toy that your child remains attached to. If your children are older than 5, have a chat with them about letting go of old toys to make space for new ones. Don’t sell the toys without your child knowing your intention. Separate toys in good condition from the ones that are broken or have missing parts. 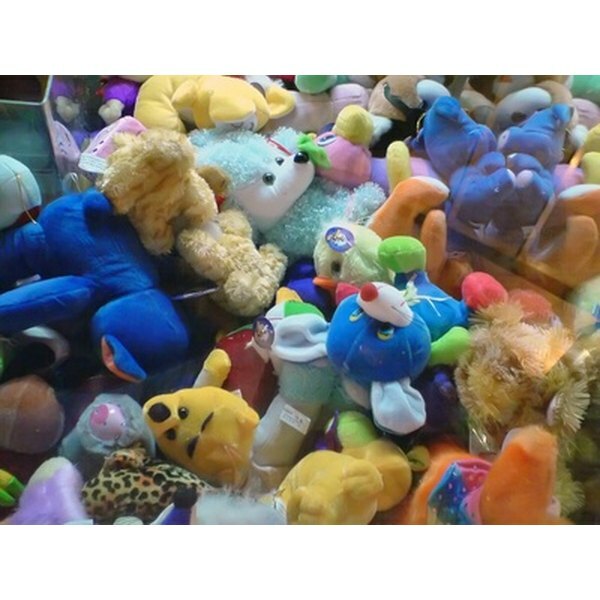 Toys that aren't in perfect condition can be sold in batches. For example, you can put five squeaky toys together and sell them for $1. Larger toys that have missing parts can also be sold for less. Read up on the toys to make sure they haven’t been recalled. You should be able to find this information by researching the manufacturer's websites or visiting the Federal Trade Commission website and searching the toy by name. Clean the toys thoroughly using an all-purpose cleaner or bleach. Rinse well with water to get rid of lingering smells and chemicals. Familymanagement.com recommends washing hard plastic toys in the dishwasher and soft toys in the washing machine. You can also scrub either type using warm, soapy water. A clean toy that smells good should be easier to sell. Sell more valuable toys online through eBay or specialty shops like Once Upon a Child and My Kids Closet. According to eBay, hot toys that bring the most money include educational toys, action figures for popular brands such as Star Trek and Star Wars, classic board games and model cars. When listing a toy to sell online, make sure you research as much as possible about it, so you can list details such as year of production, manufacturer and anything that makes the toy special—including a first edition or selling with the original box. Organize a garage sale to get rid of toys quickly and cheaply. Garage sales are a better option for larger toys, those that have some damage or that you don’t think will bring in much money. When setting up your garage sale, place several boxes or small tables and group the toys by price or type. More expensive toys should be prominently displayed. Put price tags on everything. Add a note if parts are missing or the toy is broken. Life of a Mom: How Can You Find Out if You Have a Toy That Has Been Recalled?